Mount Kaikoma (甲斐駒ヶ岳, Kaikoma-ga-take) is a mountain of the Akaishi Mountains, located on the border of Hokuto in Yamanashi Prefecture, and Ina in Nagano Prefecture, in the Chūbu region of Japan. Location of Mount Kaikoma in Japan. The peak is 2,967 m (9,734 ft) in elevation. Mount Kaikoma is protected within Minami Alps National Park. It is one of the landmark "100 Famous Japanese Mountains." Mount Kaikoma is one of the centers of Japanese Shugendo in the region. 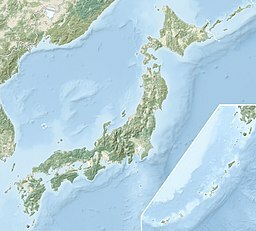 There are 18 or more mountains in Japan that are referred to as the "Komagatake (Koma Mountains)" (駒ヶ岳 Koma-ga-take). Mount Kaikoma is the tallest of them all, just beating out neighboring Mount Kisokoma by 11 m (36 ft). The Ina Valley is located between Mount Kaikoma and Mount Kisokoma. Marishiten peak (摩利支天) is to the southeast. The most popular route to climb this mountain is from Kitazawa Pass on Minami Alps Gravel Road. It takes four and half hours from the pass to the top. The other major route is a traditional one on Kuroto-One, it takes eight hours to the top. There are mountain huts on Mount Kaikoma, that are opened during the mountain climbing season. There also are some specified campsites. A large one around "Kitazawa-Tōge (北沢峠)" is used as base camp for climbing Mount Kaikoma and Mount Senjō. It is on the main ridge line in the northern part of the Akaishi Mountains. Wikimedia Commons has media related to Mount Kaikoma. ^ a b Mount Kaikoma. (in Japanese) Minami Alps Net. Accessed July 1, 2008.